Natsuno summarized this particular day so well. We woke up at 4:30am after sleeping at 12:30am. I woke up remembering our evening bath at the public bath (yes, you shower in your birthday suit with a roomful of other strangers also in their birthday suits....then you all get into a giant tub and soak..).Separate rooms for men and women. We packed our bags. We were fortunate enough to get a chance to leave anything we didn’t want to travel with at the temple, to pick up later. We left the temple at 6am and took 3-4 different trains to the fish market. It was the cleanest fish market I have ever been to. You could close your eyes and actually forget that you were in a fish market. It didn’t have any fishy smells. We walked around a bit then finally got into one of the restaurants to eat sushi and sashimi. That was honestly the most delicious, freshest sushi and sashimi I have tasted in my life. It was so unfortunate though that we were running late and had to finish that breakfast and my beer in a rush to make it in time for our bus to Mount Fuji. We had a crazy rush to get to our bus. The backpacks we were carrying plus the fact that we had slept for only 4 hours and been up and about from 4:30am made the rush even more frantic. At the different train stations, we were running up and down stairs with our ginomous backpacks. Finally we got on our 3 hour bus to Mt. Fuji. I slept for almost 2 hours of that journey. The plan at Mt. Fuji was to rent bicycles and go on a 1 hour scenic ride round the lake by the mountain – 3.3kms. The view was so beautiful from the moment we got there. I only learnt how to ride a bicycle in early 2016 and my cycling endeavors to date had been limited to the office parking lot and the backyard of our house. This was essentially going to be my first time riding my bicycle in the real world. Starting is always the hardest. I have a good 10 seconds where it looks as if I have equal probability of ending up flat on the ground as of actually getting the bike to pick up speed. Once I do confirm that I am moving, I freak out when I move too fast. I freak out when I see a stone in my path. I freak out when I see a slightly downhill path ahead. I freak out when I see a couple pushing a pram slowly in front of me. I freak out when a dog stands in my path. In short, I am an amazing rider if I am alone on a completely flat course with no unexpected events e.g. a leaf falling off a tree. Yep! So the group started off. It was great to be cycling with people as I instantly felt that I cannot let it be seen just how rudimentary my cycling skills were. I had to prove that I did not need to employ my flintstones way of stopping the bike with my feet. Yes, I know how to use my brakes. I needed to prove that I didn’t need to walk my bicycle down inclines. I could ride and put just the right amount of pressure on the brakes to ensure I didn’t speedily go tumbling to my death at the base of a cherry tree. Eventually I lost track of the group cause I decided to go at my pace (a snail’s pace.) I actually had a wonderful ride. The track itself was beautiful – extremely scenic. Babies on strollers crossing the path were few and far in between. I got lost and ended up going round the course 1.5 times – without falling once. I was extremely proud of myself. We still had a bit of time by Mt. Fuji. I joined everyone else at the resort. They had been extremely welcoming – storing our giant backpacks for free, letting us use the wifi. We then took a bus to get us to the train station in which we would get on the world’s fastest train – the Shinkansen. The day was only halfway done, but we had already had lots of adventures! So Natsuno happened to go to school with the coolest, nicest, sweetest guy who later became a Buddhist monk. His temple was not too far from Tokyo and we would be spending the day and night there. We left our hostel at 9am, caught quite a few trains. One of the trains was on the chuo line – infamously known as the Japanese suicide line because of how many people commit suicide on that route. Natsuno also told us about another train line called the “groping line” where creepy men like to touch young women. Creeeeeeeppy. We finally made it to the temple right around lunch time. We first got to meet Jokan – Natsuno’s monk friend. He was very welcoming and gave us a brief introduction to the temple before bringing us to join the rest of the group of mostly ladies (both young and old) who would later guide us through the tea ceremony, help us get into our kimonos and teach us the importance of each of the ceremonies. We all sat down on the ground to eat from the low tables. Lunch was delicious noodles – we were instructed to eat them with quite a bit of slurping noises to show we were enjoying it. It was quite liberating to break this eating norm we had grown up with – of not making loud noises with your food. Soon we were all having a blast. The older women did not really speak English, but we were all able to communicate with hand gestures, smiles and a few words that transcended language – me Kenya, her Ivory Coast:-). The ladies were all magnificently dressed in their kimonos and so graceful even as they ate. After a few minutes, my thighs started killing me. Sitting on the ground in semi-tight angles is a learned art. I kept on shifting around to get rid of the pins and needles on my feet. After eating we were split into groups for the tea ceremony. Tea ceremonies are steeped in Buddhism and is an art of performance with certain steps that have to be followed. Silence and paying attention is a very important aspect of tea ceremonies. We each removed our shoes and were led to thin pillows where we would kneel or sit on depending on the part of the ceremony. The hosts/ladies who would be serving us tea entered the tea room and welcomed each guest. The hosts then proceeded to ritually cleanse each utensil with such elegance – the tea bowls, the whisks, the tea scoops etc. in front of us and with very precise motions. The tea was then prepared in front of us. Slowly we were each served in turn – the lady serving would bow and the guest would bow receiving the tea. Before sipping from the cup, each guest would turn to the guest next to them and raise the bowl (this is a gesture of respect to the host.) The guest would then rotate the bowl, take a sip and thank the host for the tea. This process would be repeated till all 7 or 8 in our group had each had a sip. After this we were all individually given our tea with a few more formalities. We were also given some delicious confectioneries to take with the tea. I might just be imagining it, but that tea felt really special compared to other teas I had drunk as I got to fully concentrate on just enjoying the tea. The peace and solitude of getting to eat or drink something without having to talk, think etc. I was beginning to understand the magic of silence. We live in a very noisy world and this noise distracts us from enjoying simple pleasures. After all the guests have taken tea, the host cleaned the utensils in preparation for putting them away. The hosts then collected the utensils. In total our tea ceremony lasted around 1.5 hours though I’ve heard they can last up to 4 hours. Tea ceremonies, similar to meditation are about finding the sacred in everyday life. The 7 of us had a wonderful dinner. The noodles were quite delicious. Around 4am we were back in the hostel and passed out. The next morning I was strangely up by 10am, despite having set my alarm for 2pm. We went exploring our neighborhood with the rest of the team. We explored tea shops, cute shops selling all sorts of delicious looking stuff. The highlight of our walk was finding the 100 yen shop. Suddenly when everything in a shop costs around $1, everything becomes a must-have…Even when that needs to fit in your 18kg backpack:-). We grabbed lunch from a cute little place that had a buffet and sold each container by weight…of course this #miroinjapan filled her container with shrimp and all other stuff that is usuallypricey. Veggies for who? Not when a pound of veggies and a pound of shrimp cost the same. On our way home I instantly spotted a happy hour place. Even with my non-existent Japanese, Ican spot images showing buy one get one beer free from 7-9pm. I was very excited to have our first happy hour in the actual Tokyo – as opposed to Tokyo restaurant in Nairobi. Unfortunately the place was too full to accommodate a group as large as ours. We ended up finding another bar and drinking sake. Jetlag was setting in. We were home by 9pm. One of my most exciting purchases from the 100 yen shop was a foot mask that promised to reveal the inner princess hiding under the scales on the sole of my feet. Everyone said that the masks in Japan are amazing. I soaked my feet for half an hour in the mask expecting to see miracles in the morning. I hate to say it, but not all masks are created equal. I woke up to the same reptilian appendages. We would later learn that for chapped feet, there is only one solution – the revolutionary babyfoot, designed in Japan – check out the comments on the youtube video – 99% of them are people reminiscing about the absolute pleasure of peeling off the skin from your feet like an orange….sigh..Good times.. One of my our mirozinjapan – a Moroccan who lives in France had said amazing things about it. We were not disappointed when we did eventually find it weeks later. As a sidenote, if you are in Dakar and want Baby foot, Mouna sells them at her store – Massala shop – online and in Yoff. Highly recommend it. There is something so therapeutic about watching the dry skin from your feet peel off like a snake’s skin to reveal your inner baby foot…..sigh….I think I need another round of babyfoot. I slept at 5am and was up early to finish work. I hastily packed from 1:30 – 2:15pm. I consider myself a semi-seasoned backpacker. As such I know the essentials to pack. What really holds me back is the stupid stuff I add. I confess that I added around 2kgs of necklaces, bangles, rings and earrings to my 16kg backpack bringing it to an epic 18kgs (of which 2kgs was frivolity at its best.) I got to the airport. My backpack was weighed and that’s when I confirmed that it was indeed 18kgs. Ciku! Oops I did it again. I always pack my backpack with the best of intentions, but then end up adding jewelry, nail polish, lipsticks en masse. This is the monkey on my back. I think it might be a demon. The demon of packing unnecessary stuff. It was a 3 hour flight to Addis with a brief layover followed by an 8 hour flight to Hong Kong, but we didn’t have to get off the plane. We arrived in Tokyo to the friendliest immigration officials. Too many experiences have always left me tentative at such interactions – waiting for it to be a hassle, waiting to be pulled aside on a technicality etc. So when I walk through immigration without any problems, that is worth mentioning. All our bags also made it to Tokyo! We had landed at 8pm and of course none of us had Yen. All the exchange bureaus had closed. We were wondering how we would get money to pay for our train to our home for the night. After a while we found a vending machine that took your dollars and gave you yen. Amazing, right? We found yet another vending machine that sold sim cards…What is this country where things work like clockwork? We were all impressed, but trying to play it cool. Of course we have vending machines in Africa for changing money and buying sim cards! Mschew! Where do you think we are from? The fifth world? No my friends, we are from the third world:-). Finally we got our train tickets and jumped into the train. It was to take us 90 minutes to get to our stop. I was assigned as the one to be on the look-out for our stop. I was vigilant for the first 60 minutes, but then I started getting distracted by the bright lights and lovely shops outside the train. It was mad rush as everyone grabbed their backpacks to get out of the train before the train doors closed. We all made it out and spent a good two minutes dying of laughter about how we almost missed our stop. April/May2016. We were going to spend an epic 2-3 weeks traveling through Japan. We? You’re curious who we were. A group of 18 miroz who took to calling ourselves #mirozinjapan and our amazing friend and tour guide the one Natsuno Shinagawa. A few books should be written about Natsuno. She’s a sort of urban legend – except she’s real. She once traveled overland, including hitchhiking, solo from Jo’burg to Cairo for 8 months (although according to her, “it is not possible to go anywhere “solo” in Africa” You will always find company). When studying in a prestigious Japanese university, she made a name for herself by becoming the first student to request an “exchange” to Makerere. She has been a street hawker in Sudan, Senegal and Djibouti selling bic pens with cutout old/rejected ID pics of her and her Korean friend (hey, you gotta add value to your products when selling them, right?). She credits getting her previous job to going to see a voodoo man in Benin. Her favourite places on earth include North Korea, Iran, Somaliland, Papua New Guinea (Yes, she has visited all these places and many more.) She organizes guided trips to Somaliland and Eritrea. She barely needs sleep, parties like a rockstar and is extremely hardworking. Yes, Natsuno is real. So us 18 #mirozinjapan knew we were up for a crazy, fun, wonderful trip with Natsuno as our guide in her home country. The travelers were from Kenya, Cote d’ivoire, Morocco, Senegal and Uganda. Natsuno was extremely organized and not a single #miroinJapan was denied a visa. This is saying a lot when you are a Passport undesirable. The visa process for Japan was actually quite simple as long as we had all the needed documentation. Natsuno made sure we had all of this – including email threads that proved we knew her to ensure we were not going to become #miromailorderbridesinJapan. The itinerary was already the stuff dreams are made of. ‘Nuff said….The itinerary – as sent by Natsuno…..
Group A: April 30 – May 5. Recommended for those who do not have time, but who want to visit photogenic places. Group B: April 30 – May 7. Recommended for those who efficiently want to visit both touristy places and off-the-beaten destinations. Group D: April 30 – May 13: Recommended for those who want to become Japanese. Group E: May 7 – 13. Recommended for those who want to get a PhD degree on a subject called Tokyo. April 30: Arrival in Tokyo. Depending on your arrival time and how tired you are, we will stroll around Tokyo. May 1: We will head to my friend's temple, and take a nap first. After lunch at the temple, we will learn to wear kimono and experience the traditional tea ceremony. We will then learn about the Japanese Buddhism and spirituality in the early evening, and all head to the public bath nearby. after taking a bath, we will do s zen meditation, and head to a traditional restaurant nearby for dinner. We will sleep in the temple at night. May 2: We will go to Tsukiji fish market super early in the morning, and have the best sushi in the world for breakfast. Then we will leave Tokyo early in the morning and depart for Nagoya via Mt. Fuji. We will do a mini hike near the beautiful mountain. We will then catch "shinkansen", the fastest train in the world to head to Nagoya, and will be met by Kohei, a very good friend of mine who is in love with Africa. We will all have local Nagoya food for dinner and sleep in the city. May 3: We will visit Nagoya castle. we will then see a traditional matsuri (festival), Takebana Matsuri in Gifu. Then we will drive to Shirakawago Village, a UNESCO heritage traditional village. We will sleep in ryokan style guesthouse. May 4: We will stroll around the village a bit, and drive to the Japan Alpes. We will take "rope way" and go to roten buro, natural outdoor hot spring. We will head back to Shirakawago, where we will learn how to make traditional wood shoes from the local elderly. May 5: We will head to Takayama, a traditional town in mountains, another UNESCO heritage town with traditional architectures. We will then do "hanami (picnic under the tree of cherry blossom)", drive back to Nagoya, and catch a night bus to go back to Tokyo. May 6: Arrival in Tokyo early in the morning, and we will (hopefully) get some rest in Tokyo before we head to Ohira, my hometown. There, we will visit a local primary school. Japanese schools are awesome, especially the way they are organized and managed. I’m sure that this experience will blow your mind in many ways! I am arranging some interaction sessions with kids, and have kyushoku (school lunch) with them. You can also participate in some activities like cleaning, which actually is quite fun. After visiting school, we will do cycling in my village. we will head to Ohira-san, a mountain with some shrines and temples. It is actually super nice. We will then be picked up by local host families, and experience a Japanese family life for a night. May 7: My dad will take you to his dojo, and you will have a chance to practice kyudo, the Japanese traditional archery. My dad and his friends will wear traditional outfit to do some demonstration for you. You will also meet with local kids practicing kendo and judo. After that, we will go to a nearby mountain and pick up some wild vegetables. We will then all cook together, and enjoy nagashi-somen (Japanese noodle. You have to catch running noodle in running water with chopsticks :D), and head back to Tokyo, and visit Roppongi Hills, and have a few hours of free time. Roppongi Hills is one of the most fashionable buildings in Japan, and you can enjoy both shopping and window shopping. There is also a very good modern art museum. Then we will head to nearby Tokyo Midtown, another cool place to be. This is also one of the places where you can find a chic supermarket and find a mango which costs USD 70. In early evening, we will throw ourselves in the madness of Shibuya, the Mecca of Japanese high school girls. You will cross the busiest crossing in the world, and walk around to explore interesting people. We will explore depa chika of Shibuya Station, i.e., foodie’s paradise. Shibuya also has many cool bars, so we will do bar-hopping, then go clubbing. When you are tired, you can go to one of the manga café, a manga library with comfortable chairs and hot shower (!!!) and sleep there. Alternatively, you can stay in a hostel in Tokyo. May 8: I will organize a huge picnic at Yoyogi Park (just an FYI, I organize a picnic there every time I go home to catch up with friends. Usually 200 people attend!!). We will party at the park, eat Japanese food and drink sake. You will also meet my friends who are all friendly, hilarious, diverse and awesome. During the picnic, you can walk around the fashionable Harajuku Area (Gwen Stefani sings about Harajuku and “Harajuku Girls”) and Meiji Jingu Shrine, where you will probably witness a traditional wedding. My friends will be happy to show you around. We will move to an izakaya and have a nomikai (drinking party) with some of my friends in the evening. We will also go to the top of Tokyo Metropolitan Government Building to see the night view of the city. May 9: Traditional and Modern Tokyo Day. We will first visit Edo Tokyo Museum, and learn about the history of Tokyo. This museum really is so much fun. It is also located very close to Tokyo Sky Tree, the tallest architecture in Japan, which is not really worth entering but quite cool to view from outside. We will then watch sumo in live, and have traditional bento (lunch box) for lunch. After sumo, we will visit the Sensoji Temple and have a few hours of free time in the traditional Asakusa Area. Then we will go for an all-night karaoke. There will be a space for you to take a nap. Alternatively, you can stay in a hostel in Tokyo. May 10: We will visit Kamakura, which used to be the capital of Japan in the 12th and 13th century. You can see a LARGE and gorgeous statue of Buddha there. After visiting some shinto shrines and old town, we will move to Yokohama. We will go on cruising at night...but this is not a normal boring touristy cruising. 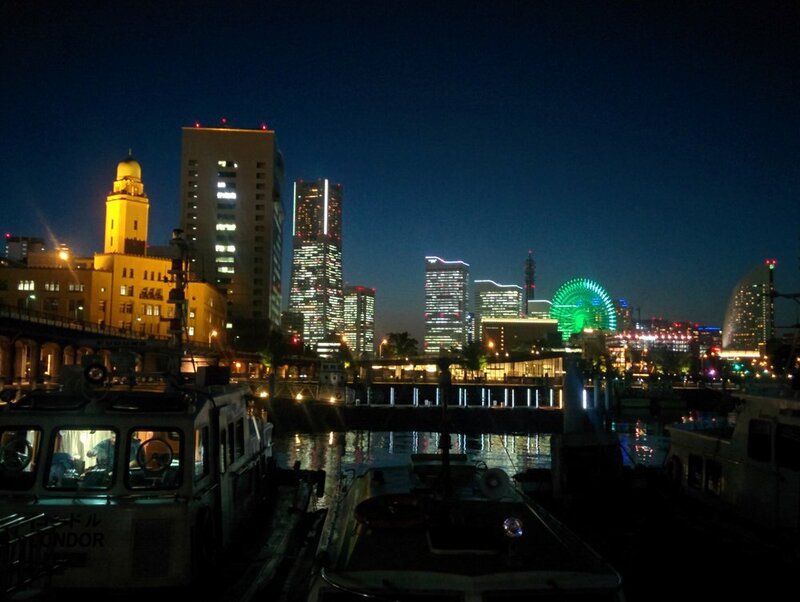 We will pass by beautiful Yokohama Bay and the largest industrial areas of Japan. May 11: Shopping Day in Tokyo. We will do a late morning., and go to Akihabara, the Mecca of otaku (geek) culture. We will stroll around a bit together, and will have a free time for a few hours. This is where you can buy electronics at a very good rate, and there will be English-speaking people who will assist you. We will take a coffee at a Maid Cafe, where you will be served by “kosupure” girls. We have picnic lunch at Ueno Park, and walk to Ameyoko Street, where you can buy pretty much everything from grocery to cheap kimono. My recommendations are 100-yen shop, the Japanese version of one-dollar shop but FAR BETTER, and “Don Quixote.” We will have another few hours of free time for you to shop around. If you want to buys specific things in Tokyo, let me know so that I can take you where you can find them. Group C will head to the airport after enjoying shopping. Group D will head to Shinjuku, and go to the Robot Restaurant for dinner. May 12: Quiet and Noisy Tokyo. We will first visit Yasukuni Shrine, the very controversial war shrine which is causing political problems in East Asia. This is also a controversial war museum, and I personally think that this is a very good place to learn about complexity of the Japanese history. We will then visit the Imperial Palace, and continue to the Koishikawa Garden, a historical and traditional garden. We will visit the Nezu neighbourhood and then Sugamo, so-called Mecca of the fashionable and energetic elderly people. You can probably ask them about their secret to stay healthy for a long time. At around 5pm, we will head to Koenji, and start getting ready for "Le Petit Dakar à Tokyo" - a one-night-only bar where I will be bar-tending at! We will all meet guests and friends. Let's show how cool the bar culture can be in Africa! May 13: “Off-the-beaten-track Tokyo.” We will take a train to Okutama Area, where you can see a number of tiny villages in mountains…believe it or not, there is a countryside in Tokyo. We will do some easy walk in the mountains, and visit abandoned villages. These villages are very little known even among the Japanese people. You will literally and extract discover pre-WWII books, furniture, etc.